Introduction: During the last decade, the Versajet™ hydrosurgery system has become popular as a tool for tangential excision in burn surgery. Although hydrosurgery is thought to be a more precise and controlled manner for burn debridement prior to skin grafting, burn specialists decide individually whether hydrosurgery should be applied in a specific patient or not. 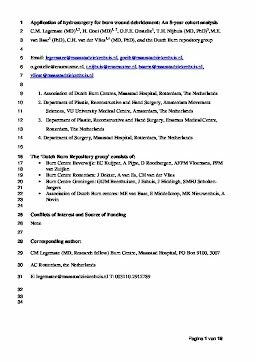 The aim of this study was to gain insight in which patients hydrosurgery is used in specialized burn care in the Netherlands. Methods: A retrospective study was conducted in all patients admitted to a Dutch burn centre between 2009 and 2016. All patients with burns that underwent surgical debridement were included. Data were collected using the national Dutch Burn Repository R3. Results: Data of 2113 eligible patients were assessed. These patients were treated with hydrosurgical debridement (23.9%), conventional debridement (47.7%) or a combination of these techniques (28.3%). Independent predictors for the use of hydrosurgery were a younger age, scalds, a larger percentage of total body surface area (TBSA) burned, head and neck burns and arm burns. Differences in surgical management and clinical outcome were found between the three groups. Conclusion: The use of hydrosurgery for burn wound debridement prior to skin grafting is substantial. Independent predictors for the use of hydrosurgery were mainly burn related and consisted of a younger age, scalds, a larger TBSA burned, and burns on irregularly contoured body areas. Randomized studies addressing scar quality are needed to open new perspectives on the potential benefits of hydrosurgical burn wound debridement.